The launch of SpaceX’s Falcon Heavy could become a defining feature in humanity’s exploration of space, but this impressive technical feat opens up a new frontier of questions around technology and politics. SpaceX founder Elon Musk grinned gleefully as he watched the successful launch of the rocket. The billionaire investor whose fortune lies in the success of Paypal, but perhaps most known for his electric car company, Tesla, has apparently sunk hundreds of millions of dollars of his own money into the venture, and so any failure would have come at a great personal cost. The Falcon Heavy rocket is the second most powerful to launch. It comes second in power to NASA’s Saturn V, the rocket that sent humans successfully hurtling towards the moon, and last launched in 1973. SpaceX claim the: “Falcon Heavy can lift more than twice the payload of the next closest operational vehicle, the Delta IV Heavy, at one-third the cost”. As with other SpaceX rockets the booster stages are designed to be reused. This feature allows for some of the drastic savings needed to make space exploration commercially viable. Musk’s hubris and boastful salesmanship has embellished his ventures thus far, and has given his detractors easy ammunition to scorn his ambitions when they’ve not reached their lofty goals. However, watching the Falcon Heavy launch it was hard to dislike him. 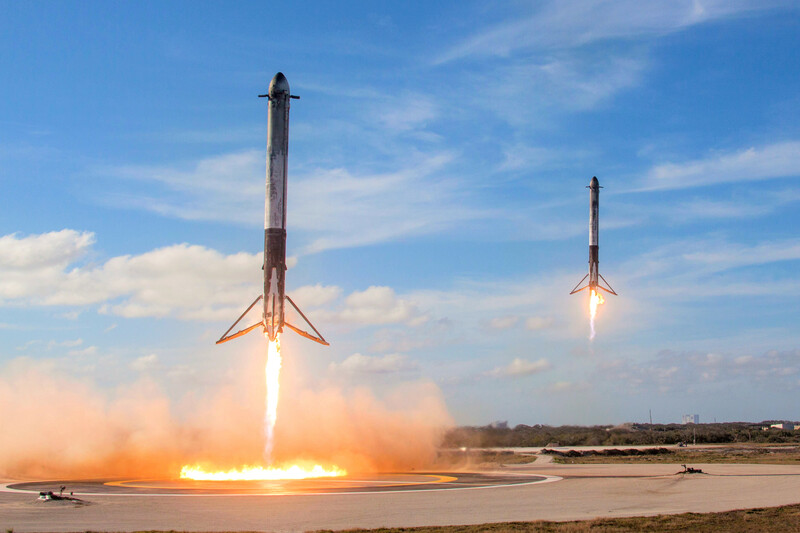 The synchronous landing of the rocket’s two booster sections was immensely impressive, of beauty even. Watching the launch felt like a momentous occasion, like humanity could fulfil greater goals. The towering tenacity of it all is one of its most disappointing aspects. This is certainly a new paradigm in space exploration, one in which states are losing to private individuals. Accessed instead by the whims of the super rich. The fact that two tech bros, Musk and Amazon’s Jeff Bezos, are dominant in the private space is telling. The rockets themselves point towards space like gigantic phallic symbols, as toys of men fulfilling childhood fantasies. Mind, why would you get into the game of say buying a bigger yacht than the last billionaire when you have personal ambitions to colonise Mars. Back on the ground both men are regularly accused of exploiting workers in pursuit of their enormous wealth. Whether that’s on Tesla’s factory floor, or in Amazon’s dehumanising warehouses. Making the foundation of this new frontier anything but new. It instead builds upon technology that allows for the increasing alienation of workers in pursuit of their profits. When looking up towards the stars and the endless possibilities of space it’s also easy to forget the state of the world we currently live in, and the problems we face at home. Far beyond the confines of earth the rules are changing. Private individuals are breaking government monopolies, and one man alone has the vision and the capital to send humans to Mars – which he may well achieve. The mastery of space is becoming privatised, and this is something we should question. Should we, as humans living on a common planet, have more of a say over our collective futures, should we not have more of a say over the science and technology that is such a defining feature of our modern lives, and if so, how? Of course these new forms of technopolitics go far beyond rockets. But if humanity is going to boldly go where we haven’t been before then surely we should have collective say in how we go about it, and what the rules should be when we get there.